As birders, our goal is to find and identify birds. That is what we do when we are out in the field, driving, doing yard work, or just glancing out the window. Our overriding urge is to see and then identify birds. Fortunately for us, birds are everywhere. No matter where you go in the ABA area (and, I dare say, the entire world), there are birds to be seen. And as I mentioned in my previous post, we should always be prepared for the unexpected, as you never know what you will find, even in unlikely places. All of this put together means that seeing birds is relatively easy. The second part, identifying, can be more difficult. We try to identify every bird we see. Sure, if a bird is too far away or if the conditions are poor (low light, back light, fog, etc. ), we may admit that we aren't sure what the bird was, aside from "It was a duck" or "Definitely a small passerine". This is of course the thing to do, because we just don't have enough information to completely identify what we've seen. What I want to discuss is when we have an abundance of information: when the bird is a few feet away in good light, providing excellent views. This is when the urge to identify, to name every individual possible, can get us into trouble. Imagine the scenario that you are birding with friends. A small bird sits up on a close perch, and you are the closest to it. You get a good long look through your binoculars, and then it disappears back into the brush. You are very confused by the bird, and aren't sure of any specific ID (and in fact you aren't quite sure what family it was in). Your friends weren't as close and didn't have the view that you did; they ask you, "What was that?" This is when it is tempting to try to make the call; we want to identify birds, and we want to be good at it. We want to know what things are, and we don't want to seem like incompetent birders. 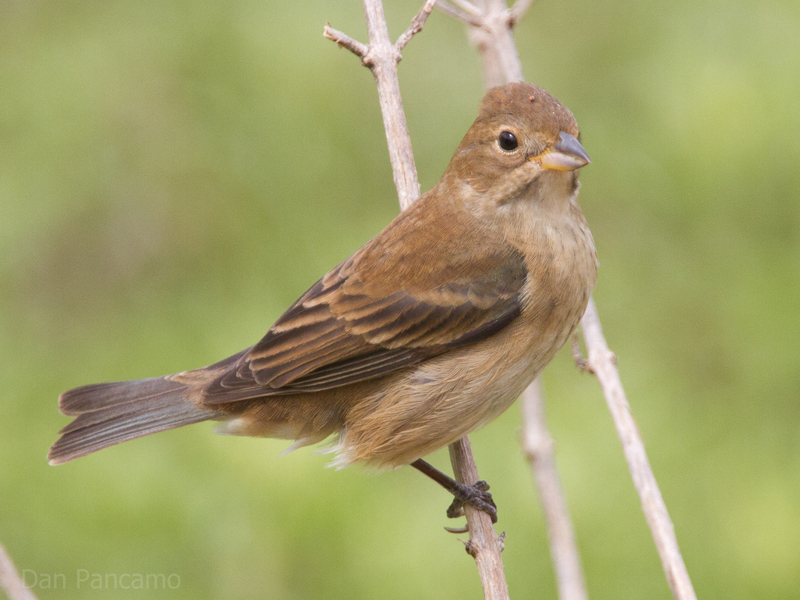 We want to say without a doubt "Female Indigo Bunting". This can be an especially powerful urge if we've spent time around birders that are better than we are, and we want to show that same ability. The last thing we want to admit is that "I don't know". "I don't know" is one of the few identifications we can ever be completely confident about. If you say you aren't sure, you are being completely honest and are completely right. When we identify birds to species, there is always that lingering possibility that we are wrong (hybridization, mutation, environmental contamination, etc., can all cause an obvious identity to be subtly or completely incorrect). Another benefit is that saying we aren't sure shows other birders that it is okay to be uncertain, that it is okay to question what we saw. These sorts of uncertainties can lead to good outcomes. In the scenario above, imagine you call out "Indigo Bunting". Your friends may keep walking, accepting your ID. You've just lost an opportunity to perhaps learn from your birding group's collective knowledge. If you say you aren't quite sure, perhaps someone more familiar with that age/plumage/subspecies will have some helpful insights into how to identify that individual, things you can use for the future. Alternately, perhaps you say I don't know, and your birding group takes a closer look and finds a Lazuli Bunting, a rare bird in your area. Now you've learned something and helped find a rarity. The final, and least desirable, scenario is that you make the Indigo Bunting ID, despite your uncertainties; one of your birding friends happens to come across the same bird and makes the correct ID. Now you're embarrassed about the misidentification, and perhaps miss out on a good learning opportunity because of it. It is IMPOSSIBLE to identify every single bird every time. Admitting that you aren't sure is always okay. It doesn't mean you are a bad birder, just that you are honest. Birders at every level make mistakes. Saying "I don't know" is never a mistake.